Merchoid has the new and exclusive Marvel Christmas sweaters that promise to be as comfortable as they are colorful and ugly. The company boasts that they are also fully licensed, meaning that you don't have to feel guilty about purchasing them. Marvel Studios and Disney will be getting more of your money, so don't worry! If you're reading this, then you're one of the lucky remaining half of the population, which means that you can buy one of these ugly Christmas sweaters. First up is the Spider-Man pair of sweaters. The 'Tis The Season To Be Spidey Sweater is for Marvel fans who are into the edgier movie stylings of Peter Parker. The second design flaunts a a more classic web crawler look, which is called the Swingin' Through The Snow Sweater. Both designs are obviously designed with Christmas goodies including reindeer and snowflakes, keeping that ugly Christmas sweater party alive and well this year. For Marvel fans who would rather go a darker route, there's the Season of the Symbiote Sweater, which could make you drink too much eggnog and end up on the naughty list this year. The Venom sweater takes its look from the classic symbiote logo, and is actually quite stylish, though it may be really difficult to take off. It's unclear if the sweater will make you hear voices in your head, but it's a possibility. The Captain America: Red, White and Blue sweater is also available, giving a more American take on the holidays. Designed after Cap's iconic suit, the sweater has a shield on the back, just in case any of those family arguments get too out of control this season. The Steve Rogers flair has an added bonus of some Christmas Trees. Thor's Merry Mjolnir Sweater is also one to check out for Marvel fans. It has a back resembling Thor's cape along with a design inspired by the graphic novels. You might just be able to wield Mjolnir while wearing this ugly Christmas Sweater. The Black Panther Wakandan Wishes Sweater is available as well to get into the holiday spirit. The T'Challa sweater is probably the least ugly out of the whole group due to its cool color scheme of black, gray, and purple. While the Black Panther sweater is the least ugly, the Avengers Sweater has you covered in the ugly department. 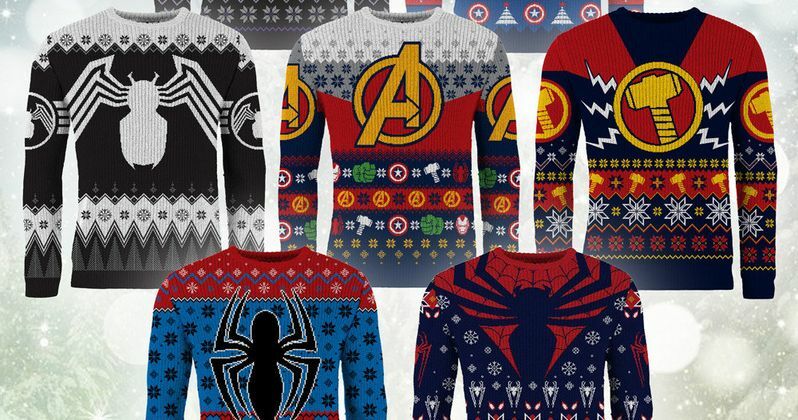 It pretty much looks like Christmas and Marvel barfed on a 100 percent knitted sweater, which might be exactly what some Marvel fans are going for. The Marvel ugly Christmas sweaters are $54.99 each, and they are shipping now, so you can get one in time to go see Venom in a few weeks with your cool new sweater. You can head over to Merchoid to check out the rest of the sweaters and maybe even pick up some DC or Star Wars designs.